A mix of mouth warming ground chilies in varying heat intensities and flavors plus the addition of a little bit of Chipotle chilies in Adobo give this chili an intense flavor. You will not miss the beef. 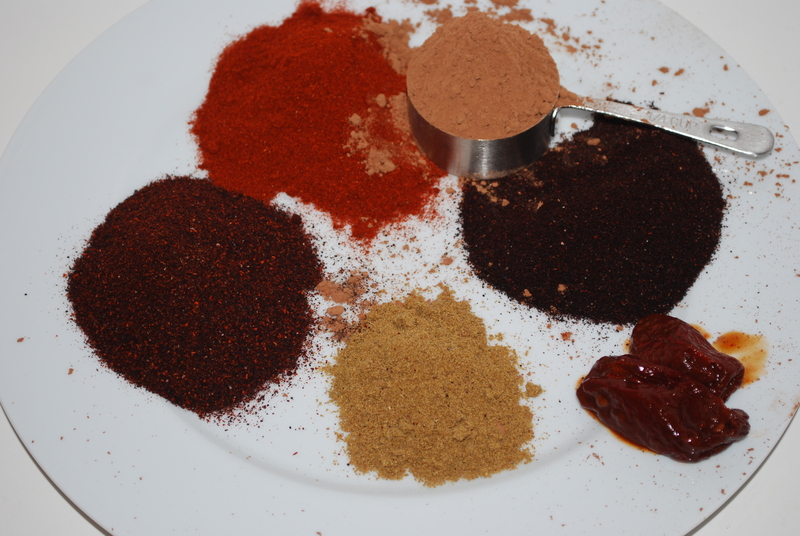 The cocoa powder deepens the complexity of the flavor and gives the chili a smooth mouth feel and appearance. Actually, I make this all year long and keep it frozen in individual containers in the freezer for college boys who come home late at night and ask for food. 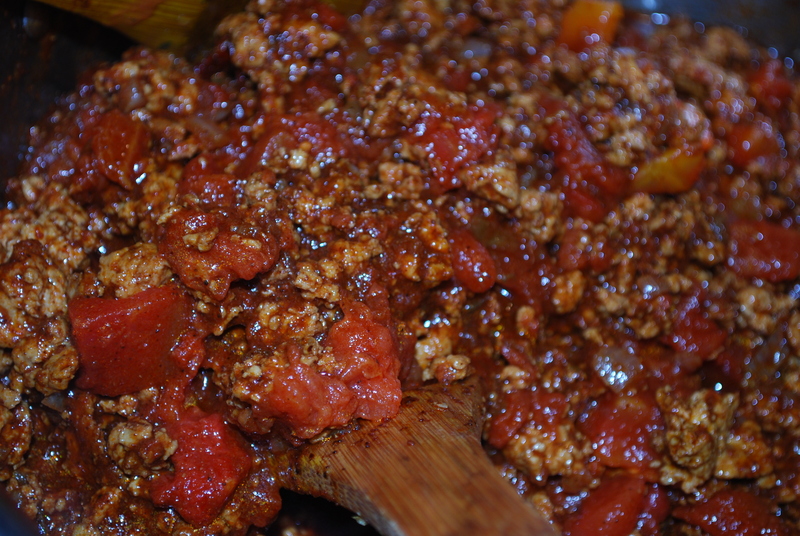 Turkey Chili goes well with Spanish rice (see recipe in the beans and rice post). It also goes with tortillas, guacamole, and pico de gallo (tomato, chile, and onion salsa). You might serve it as a side dish at a Super bowel party featuring Fajitas or barbeque chicken. Peel and dice the Spanish onions. Preheat a large Dutch oven on the stove, add the olive oil, and then add the onions. Lower the heat to medium low. When the onions are translucent, turn up the heat and add the ground turkey. Sauté the turkey using two wood spoons to break up the turkey into bits as it cooks through. Season the turkey with salt and pepper. Next, when the turkey is thoroughly cooked, add all the dry spices and sauté the mix for a moment on low heat until well combined. 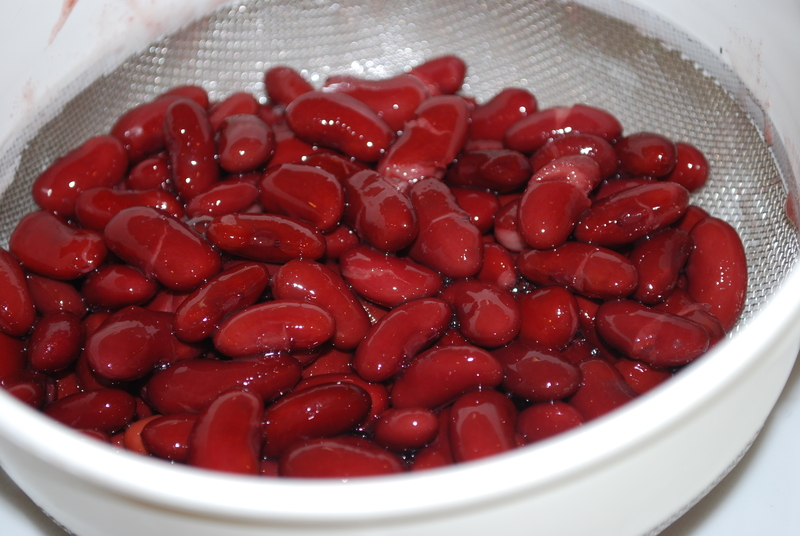 Add the beans and tomatoes and stir. Add the Chipotles and Adobo sauce. Stir and let the mix heat through on low, being careful not to scorch it since it will be very thick at this point. Mix in the first 3 cups of water. Take the 4th cup of water and make a slurie with the masa harina. Stir the slurie into the chili. Let is simmer for 5 minutes on low and then lastly add in the cocoa powder. Stir and instantly the chili will take on a smoother, glossy, darker look. Now simmer for an hour on very low, stirring every so often with a wood spoon. 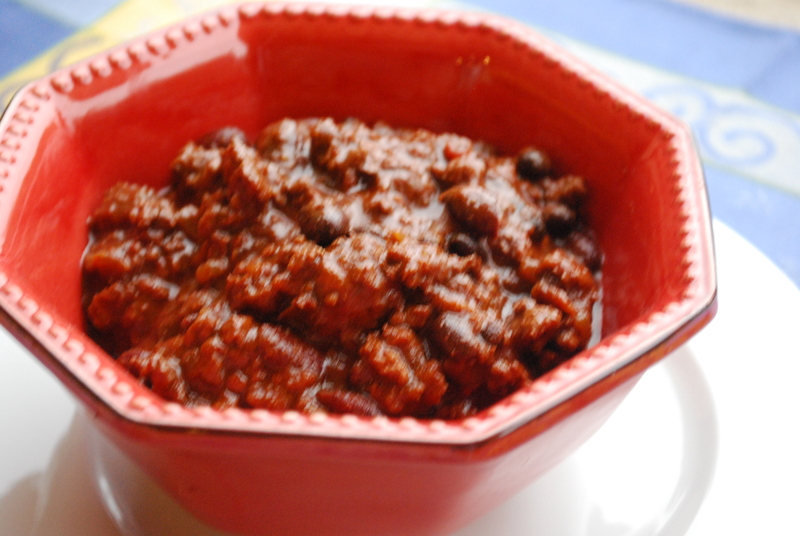 Serve chili immediately, reheat the next day, or freeze for a later use. This recipe makes a large enough quantity to eat some and freeze some.